Blogging is no easy job, sure it seems nice but there's always so much time involved. That's why it's always so much nicer and easier when you have a good group to work with. I recently joined Simply Sassy Media, a newly founded social media company that helps connect bloggers and the media. Some of you may be familiar with Mom Boost, this has now also become a part of Simply Sassy Media. I've loved working and interacting with these two founding ladies in the past and I am so happy to see them create a social media company! 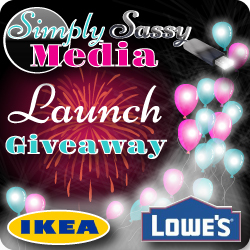 In celebrations of the launch of Simply Sassy Media, we are holding a giveaway! How cool is that? We're sharing our happiness with you. I love both these stores and I'm sure you do too. Ikea is always such an adventure and I always end up eating there even if I'm not hungry... And Lowes has always been so practical, I seem to wind up there whenever I'm trying to fix things in my apartment. Two great prizes are up for grabs so make sure you enter below. What would you get if you won one of these two fantastic prizes? Thanks for being part of such a great giveaway. This prize would be so perfect for me right now, since we are redecorating my daughter's bedroom. If I won, I'd start with buying some decorative hardware to hang items items on the wall.